All pets deserve the best, especially when away from home. For more than 50 years, Town & Country Pet Care Center has provided a comfortable & clean home-away-from-home dog boarding for your pets. Dogs of any breed love our spacious accommodations, prompt room service, and doting caregivers. Particular pet parents love the outstanding security of a stay with us. Travel, rest, and vacation easy knowing veterinary professionals from the on-site Buxmont Veterinary Hospital are on hand. We’re so confident your dog will enjoy our comfort and care, the first night is on us. Come have your pet enjoy all that Town & Country Pet Care Center has to offer. Discount subject to availability and cannot be combined with other offers. Lodging discount applies to first-time customers only and is valid for any lodging accommodation selected. Welcome to our Canine Cloud Nine! Radiant floor heating and facility-wide air conditioning keep pets comfortable year-round. Spacious accommodations come with clean, fluffy bedding and room service. Daily wellness checks delivered by highly-trained staff. Regular feedings according to your dog’s schedule. We recommend bringing your pet’s usual diet, but we offer high-quality food at no charge. We even offer a pick-up and delivery service for your convenience! Conveniently located just 15 minutes off I-95, Route 1 and the PA Turnpike. A Busy, Engaged Dog is a Happy Dog! We know you want your dog to have fun while you’re away. That’s why we offer fun-filled activities to keep any dog mentally and physically engaged. Whether your dog enjoys playing with other dogs, prefers to play fetch with a human, or just cuddle on a couch, we know vacations aren’t just for people! We’ve combined some of our most popular activities into discounted activity packages. Call us today to pick the right one for your dog! Group Play. Your social dog will love playing with canine companions of similar size and temperament in our indoor and outdoor play areas. Playgroups are kept small for maximum comfort and safety and are fully-supervised by our highly-trained staff. Individual Play. If your dog prefers the company of humans, our loving staff are more than happy to oblige. We’ll provide on-on-one play sessions doing whatever your dog loves best, whether it’s chasing a ball or resting in the sunshine. Cuddles & Love. Do you have a lovebug? We can’t wait to provide tons of cuddles, attention, and belly rubs! We’ll even read a story to your furry friend. Puppy & Senior Packages. Energetic pups and older sweethearts need and deserve a bit of extra care. Our Puppy Package comes with the extra playtimes and potty walks to keep your puppy entertained, happy and in a good routine. Our extra special senior pets appreciate the stretch breaks and orthopedic bedding in our Senior Package. Fully climate-controlled facility, with radiant heat flooring and air conditioning. Passive solar energy system for a healthier environment. Hospital-grade generator always on standby. Rubber flooring on our indoor play areas for healthy joints and soft landings. Double doors and fencing for maximum security. A brand-new daycare facility and the addition of two new, 1,200 square-foot play yards. 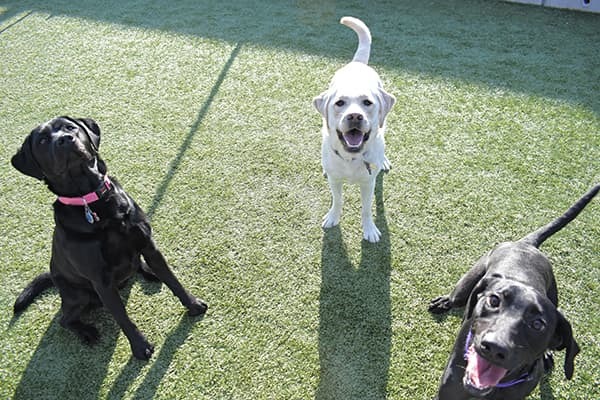 Special artificial turf on our outdoor yards for mud-free paws. Our owner lives right on-site. Because of our relationship with the Buxmont Veterinary Hospital, we’re uniquely equipped to serve dogs of all temperaments and breeds. We’re also able to serve dogs with special medical conditions including diabetic dogs.